Carlee Stelter is the lone returning starter for the Mohawk High girls basketball team. That hasn’t stopped the Lady Warriors from racing out to a 10-2 start this season, including a 5-1 record in WPIAL Section 1-3A play. Stelter is a large part of that early success and has made the transition from point guard to shooting guard seamlessly in the early going. 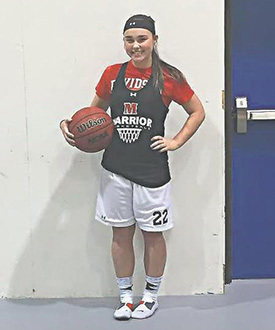 The junior averaged 15.5 points per game in two victories for the Lady Warriors last week to earn Washington Centre Physical Therapy’s Lawrence County’s high school athlete of the week honors as voted upon by the New Castle News sports staff. Stelter said moving into the shooting guard position is a role she she feels more comfortable in. Stelter’s play has reflected as much, as she’s currently averaging 10.7 points per game, which places her second on the team behind freshman Karly McCutcheon. Stelter’s 14.6 points per game over the last five games, all victories, leads the Lady Warriors. O’Lare said that her confidence and on-court IQ are part of what makes her one of the best players he’s coached. Stelter is a daughter of former Mohawk girls basketball star Lori Haswell Stelter. “She’s a really smart player and comes from a really good basketball family,” he said. “Those things combined with her hard work have helped her improve. The biggest thing we’ve noticed this year as a staff in terms of improvement is her leadership. Stelter’s smarts on the basketball court have not only helped O’Lare, but also the other four girls she plays with. Known for: Her 15.5 points per game led Mohawk to two victories against Laurel and Beaver Falls. Plans after high school: Hopes to attend Duquesne University and enter the medical field.